THIS IS A MUST READ FOR EVERY MEMBER OF KLAL YISROEL! I am not affiliated with the journal in any way, but from what I can tell they are great rabonim and leaders of Klal Yisroel that are dealing with our current issues head on. Please use the link below to visit the journals webpage. Feel free to use this blog to express your feelings on the issues being raised. Only relevant and constructive comments will be allowed posted here. The current issue has the following essays in it. Rabbi Yaakov Glasser "The Vital Role of Experiential Jewish Education"
Rav Ahron Lopiansky: Self-Inspiration: "A Tool for Life"
Rabbi Bentzion Twerski: Is Serving Hashem Still a "Jewish" Ideal? Rabbi Yitzchok Feigenbaum "Been There, Done That: Why Being Frum Is So Boring "
Rabbi Dr. Dovid Fox: "The Abandonment of the Soul: Struggle of Dispirited Observant Jews"
Chaya Newman: "A Time for Inspiration"
Jonathan Rosenblum "Creating an Environment for Developing Closeness to Hashem"
Rabbi Shalom Baum: "Looking Inward to Move Upward"
Judith Cahn, EdD: Family, School and Community: "The Psychological Impact of Connectedness"
Rabbi Dovid Goldwasser: "Defrosting Judaism"
Rabbi Yitzchok Adlerstein: "An Observation and Some Modest Proposals"
Rabbi Shaya Karlinsky: "The First Connection is to Your Inner Self"
Shifra Rabenstein: "The Good Old Days"
Rabbi Gidon Rothstein: "Searching for God Where God is Found"
Rabbi Shmuel Silber: "Struggling with Connection: Ancient Challenge, Contemporary Suggestions"
Rabbi Dovid Goldman: "Whose Torah is It?" Thirty people were invited to contribute, and eighteen agreed. Those solicited included pulpit rabbis, educators, outreach professionals, roshei yeshiva, community activists and researchers. Contributors uniformly agreed that the problem of being disconnected is real. The only people who declined to support this observation were three roshei yeshiva teaching post-high school yeshiva students. These roshei yeshiva, serving in three different types of yeshivas, each advised that they were unqualified to address the questions because they had no familiarity with the problem. They explained that their students were all intensely connected and involved, and they had no indication that this strong connection weakened in the years after the students leave yeshiva. There was a yidish expression that goes "Nisht bei Mir"! I read the frst artciles over Shabbos. Rabbi Weinberger's article is a must read. B"H! This is such a breath of fresh air. Now we all need to do something about it! 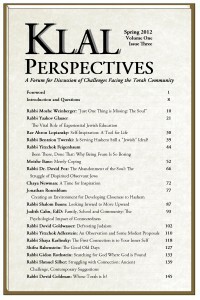 You must read "Rabbi Yitzchok Feigenbaum "Been There, Done That: Why Being Frum Is So Boring ", I know you will love it! That was the article I read first. Catchy title and I wasn't disappointed. read the rest. they are all brilliant.